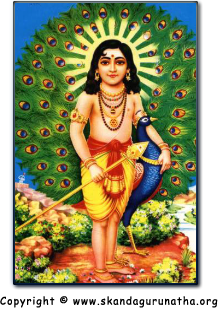 Today, as I sang Kanthar Sashti Kavasam, my attention was drawn to the Murugan picture hanging on the left-wall of our family altar room (see picture on left). In this picture, Sri Swaminatha is seen standing on a hill, holding his Vel and his Myol (peacock). There is also a temple in the background at the leftmost side. As I looked at this picture, I was reminded of the dream I had last night. Before I disclose the details of my dream, it is important to understand something. This picture that is situated on the left-wall of our altar room, I normally ignore when praying even though the inner voice inside of me instructs me to pray to it. The reason being, I was upset at the artist who drew this picture because Sri Skanda is not holding up His hand to bless. I am fond of seeing the abayahara mudra (hand that dispels fear and blesses). In my dream, I found myself bare-chested, wearing a veshti (dhoti), and clasping my hands together while singing a song. It was a rural and hilly area, as I felt myself walking up an incline. I cannot recall what I was singing. When I reached the top of the hill, I saw two figures standing near the edge of the hill. There were small shrubs and plantations on the top of the hill, where I was standing. As I walked closer to the figure, I thought to myself that I had seen this figure somewhere before. It was Bhagavan Sri Skanda! He was standing with his myol, in exactly the same pose and manner as that of the picture in our family altar. He was approximately 15-20 feet from where I was. He was smiling, wearing a veshti, and had rudraksha necklaces. 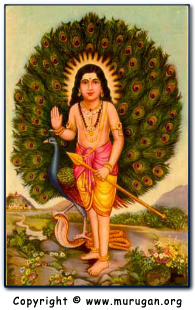 In His right hand, Murugan was holding the Vel and with His left arm, He was hugging the peacock. Then Sri Skanda did something that I did not expect - He shifted His Vel from His right hand to His left hand. He then raised His right hand in blessing and assumed the abayahara form! He did not utter a single word in this dream. I then awoke. Remember how I ignored the picture in our altar because I said that I did not like the picture since Sri Skanda is not blessing? As Bhagavan Skanda knows my innermost thoughts and feelings, He gave me His unconditional blessings which I was not able to see  due to my ignorance  from the picture in our altar. This dream also reassured me that He is not simply a picture! Sri Skanda is real and He is alive! He speaks, blesses, watches us, and gives darshan through this picture. Thank you my loving Lord for removing the maya of ignorance that I had over me, which prevented me from receiving your grace. Thank you also for dispelling all my fears with this wonderful darshan. May you always guide, protect, and bless me.